Scrolling through social media, you could be forgiven for thinking that yoga is purely the domain of teeny, tiny, thin, flexible girls. But you don't need to fit this mold to embrace and enjoy the practice of yoga. As author and yoga teacher Sarah Harry shows – it can (and should) be enjoyed by people of all sizes. Her book Fat Yoga embraces the -yoga for all' ideology: all bodies, all ages, and all abilities. This book is a step-by-step -how to' guide to yoga, with variations to suit the less mobile or flexible. This is the perfect book for yoga enthusiasts of every level and body type. It invites its readers to explore their physicality in a way that's safe emotionally, physically and spiritually in the comfort of their homes or with friends. Psychotherapist, yoga teacher, researcher and university lecturer, Sarah Harry is considered an expert in body image. She is regularly in the news, on TV and in print as both an expert and a fat yogi! Sarah is one of the first western yogis to offer yoga exclusively to bigger bodies. She has practiced yoga for more than 20 years and was also the 2016 Kellogg's Special K ambassador for the body positive #OwnIt campaign. Question: Why did you write Fat Yoga? 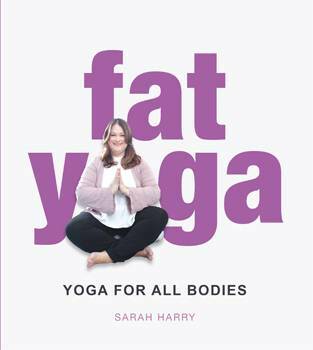 Sarah Harry: I wrote Fat Yoga as I wanted people of all sizes to be able to access the beautiful practice wherever they were. With this book you can develop your own home practice, which is a great thing to have (even if you live near a studio!) I also wanted to help dispel the myth that yoga is only for one kind of body! Yoga is for everyone. Question: When did you first start yoga and why? Sarah Harry: I first started Yoga 20 years ago when I was in recovery from an eating disorder. It really helped me heal my relationship with my body and start to reconnect and become more embodied. I have practiced ever since, but I never thought I would become a teacher! Question: What are the primary things we need to start yoga? Sarah Harry: You don't need anything fancy. Most of it you would have at home. Comfy clothes, a towel or yoga mat or even just carpet. We think we need expensive pants and accessories, but really all you need is a wiliness to show up and start! Plus yoga has many parts (called -limbs') so you are practicing yoga if you are meditating or doing some breathing work. It has many forms. Question: What do you hope readers take from Fat Yoga? Sarah Harry: I hope the book comes across as fun, informative and accessible. I think it has something for everyone, no matter your age, size, ability or injury levels.